Saluting Innovation at Amazon for experimenting with drones that could feasibly be used as autonomous delivery vehicles. 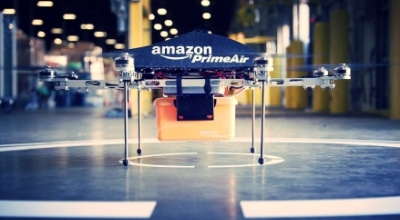 Amazon Prime Air “Octocopters” are designed to carry packages up to five pounds for round trips within a 10 mile radius making delivery times as low as 30 minutes. Due to FAA rules and regulations the Octocopter will take a number of years to advance and meet commercial use requirements however, CEO Jeff Bezos was optimistic that Amazon would legally be able to bring Amazon Prime Air online as early as 2015. Just imagine, in a few years you might be able to order a sweater or the latest iPhone and have it delivered to your door in half an hour by an autonomous drone. We salute Amazon for their dedication to innovation as they continue to conduct experiments and prototype new ways of increasing efficiency.